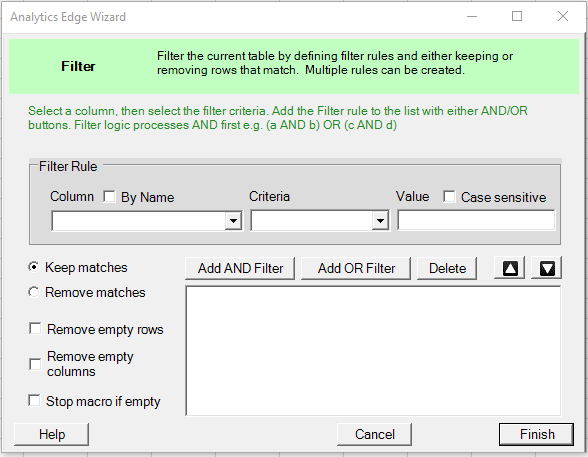 This Analytics Edge wizard lets you construct one or more filters to be applied to the current table. Filters can be combined using AND-OR logic, and you can choose to remove or keep the matching rows. Typically used to remove unwanted data from a report, it can also selectively keep rows of interest. Column – select a column by column letter position (optionally by Name). Criteria – select a filter criteria or test to use. Value – enter a value to use for the filter test. For text columns, optionally check Case sensitive to match upper and lower case letter exactly. 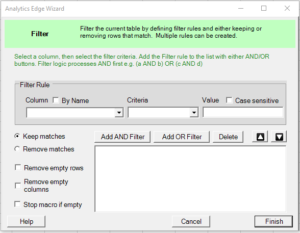 Add AND Filter – add the filter rules (Column, Criteria and Value) to the list using AND logic, meaning both this rule in addition to a previous rule entered are required to cause a match. Add OR Filter – add the filter rules (Column, Criteria and Value) to the list using OR logic, meaning either this rule or a previous rule entered will cause a match. Delete – delete a selected filter rule from the list shown. Move Up or Down – move a selected filter rule up or down in the list shown. Keep Matches – keep rows that match all of the filter rules. Remove Matches – remove rows that match all of the filter rules. Remove Empty Rows – if a row contains no information in any of the columns, remove it. Remove Empty Columns – if a column contains no information in any of the rows, remove it. Stop macro if empty – if the table is empty, then stop the macro. This does not cause an error condition, so other macros will continue to run if Refresh All or Scheduled refresh was used.